Holy cow! 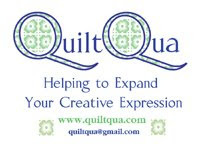 I don't know if there were only 3 quilts in the exhibited category or more but I'll gladly accept the quilt was good enough to win an Honorable Mention Ribbon at the quilt festival. I'm so tickled about this. Anyway, last picture and brag. I just wanted to close out the "story" on this one with you all. The quilt is now back at home and teen son has reclaimed it for his bed. I love it too! what a fun quilt! Congratulations on the honourable mention. I'm tickled pink for you! Congrats on the honorable mention, that is very cool! That is so awesome! Good for you!!!!! !